to the hills of Scotland. Lyndsey McAdams is the theatre teacher at P.S. 264. She is thrilled to be working with this awesome group on Macbeth: A Devised Haunted Experience. She loves being able to create at this incredible school, working with so many thoughtful students and grown-ups. She recently acted in and co-directed Classical Remix's Antigone. She also directed Civil Shadows, Cinderella, The Lion King and The Haunting of Campsite 264 here at P.S. 264. She is excited to share many more performance projects throughout the year. Over the past 11 years, she has directed many a show, some more favorites include: The Odyssey, King Richard III, Blanca Flor, The Princess and the Pea, Macbeth and Julius Caesar. She holds a B.A. in Theatre with an emphasis in directing from Atlanta’s Agnes Scott College, and a M.A. in Educational Theatre from New York University. She would like to give a special thanks to Mrs. Edison and Mrs. Mousouroulis for their support, and she would also like to give a special thanks to the cast, crew, designers and staff of Macbeth. Congratulations to the 5th grade for making this epic project all your own! Love to AC, family and friends! James Mc. McDermott is a Paraprofessional at P.S. 264 as well as the Company Manager and Actor for Classical Remix. He obtained a degree in Theatre & Performance from SUNY Purchase. James is a theatre artist who has performed and directed professional theatre in the greater NYC and Westchester area. Recent acting credits include Antigone with Classical Remix, Men Are Dogs with Narrows Community Theater, and Evita(off-off- broadway) with The Gallery Players. Recent feature/background film work include Law & Order SVU, Orange Is The New Black, Straight Line(short), and Indy with Second Gear Films. James is also heavily involved with the Drama Department at P.S. 264. Credits at the school include Underneath Egypt (Assistant Director/Assistant Choreographer), Cinderella KIDS (Stage Manager/Assistant Director), and The Lion King KIDS (Assistant Director). Macbeth has been a full-throttle experience and James is proud that this team of artists came together to create a wonderful production for these youth artists. Break legs everyone! …just not literally. Wes Laga is thrilled to be part of yet again another brilliant production for Classical Remix! This is his second year with the Classical Remix theatre collective and Bay Ridge Elementary School for the Arts. Wes is a teaching artist working in both New York and New Jersey. When he's not inspiring young minds, he is pursuing his career as a DJ. He would like to give a shoutout to his cast and crew for this AMAZING production. 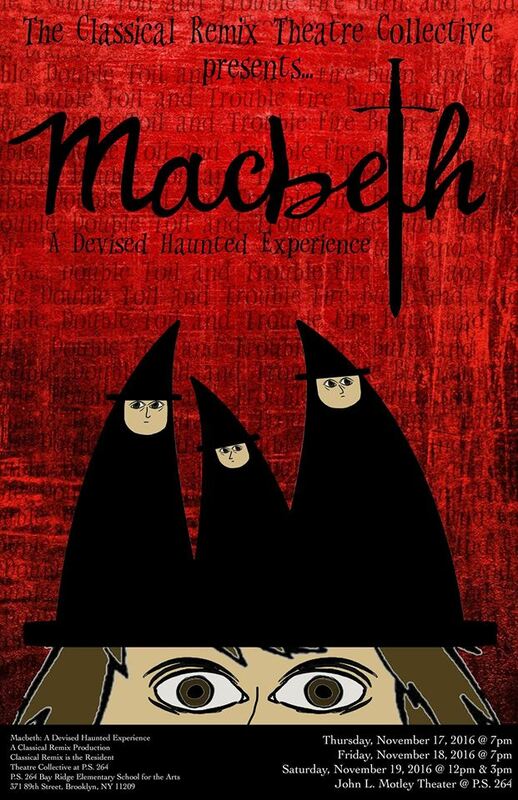 Seeing 5th graders excited and looking forward to a production of Macbeth is what the norm should be! Christa Comito is a Brooklyn native and teacher at P.S. 264. She holds collegiate degrees in Music Education and Dance as well as masters degrees in Education & Special Education. Christa has also appeared in various community theatre roles including, but not limited to- Antigone with Classical Remix, Men Are Dogs with Narrows Community Theater, Chicago with Venture Theatre and Xanadu with Venture Theatre. Christa has also worked on the P.S. 264 productions of Disney’s Cinderella KIDS and The Lion King KIDS. She sends a thanks to her family and friends for all their love and support! in Theatre Studies. Amanda would like to congratulate the 5th graders on an excellent performance. She would like to thank her parents, Barry and Patrice for always being by her side cheering her on in everything she does. She would also like to thank her fiancé Howie for always supporting her without any question or any doubt. She would like to thank her son for coming to every rehearsal with her and being a good boy with grandma. Mostly, she’d like to thank her grandma for introducing her to her first love, theatre.